Some composers labor for years to find a voice of their own. Matt Ulery’s has been unmistakable for a long time, whether he’s writing for big band or various incarnations of his quintet Loom or you-name-it. His newest album, “Festival,” makes that case vividly, because it features three distinct instrumental combinations. Yet the signatures of Ulery’s music — unpredictable turns of melody, unusual chord progressions and a mix of idioms from pop to classical — give the music continuity. The scale may shift from intimate to epic, the emphasis may turn from woodwinds to strings, but Ulery’s work remains urgently melodic at its core. 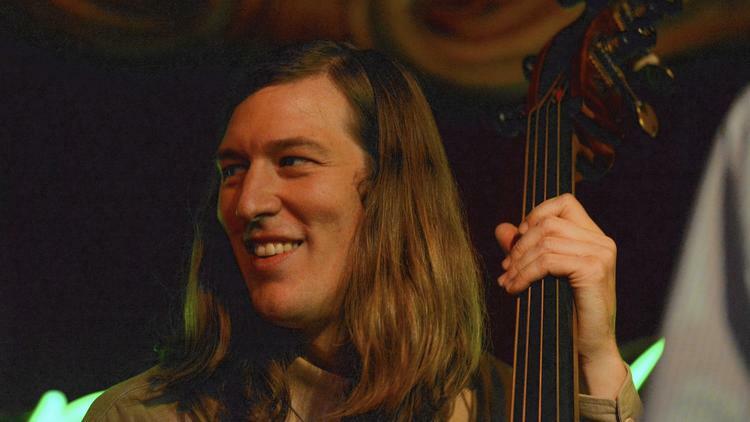 So even though one wished the bassist-bandleader had been able to showcase all the far-flung sounds of the “Festival” album during his record release party Friday night at the Green Mill, the lyrical essence of his music was palpable. And it piqued one’s interest in hearing the other facets of the “Festival” repertoire performed live. Ulery opened the evening with the first two Loom tracks of the “Festival” album and quickly made their virtues apparent. For starters, there was the cohesion of this ensemble, featuring Rob Clearfield’s gentle pianism, Jon Deitemyer’s delicate drum work and the intensely melodic front-line playing of trumpeter Russ Johnson and reedist Geof Bradfield (who focused mostly on bass clarinet). These musicians have collaborated with each other in various bands through the years, and you could hear it in the synchronicity and mutual sensitivity of the ensemble playing. For with the exception of improvised solos, the scores for Ulery’s “Middle West” and “Hymnody” — as well as for the rest of the first set — were quite detailed in what they asked of the players. Like an orchestrator working with five musicians instead of a large ensemble, Ulery was meticulous in bringing particular instruments to the fore, then to the background, at various junctures. Ever-changing instrumental combinations yielded a range of colors, the composer keeping tight rein on what the musicians did. The chromatic melody lines and hypnotic rhythms of “Middle West,” for instance, instantly identified the piece as coming from Ulery’s hand, as did the gradual crescendos and decrescendos. This was music that ebbed and flowed, Ulery — as usual — avoiding grand climaxes or dramatic changes in dynamics. His “Hymnody” proved still more subtle, starting with Clearfield’s nocturnelike opening. Imagine piano music of Chopin cast in contemporary harmonic terms, and you have a rough idea of how Clearfield addressed his instrument. As the rest of the band began to play, Ulery’s score called for pastels, an apt extension of Clearfield’s opening and closing statements. The sharp rhythmic accents and deep-swing sensibility of Ulery’s “Ecliptic,” also from “Festival,” might have sounded aggressive when dispatched by any other band. But Loom’s unhurried tempo, Johnson’s soaring trumpet solo and Bradfield’s sinuous phrase-making on bass clarinet softened the edges of this music. Everyone in this band stands as a leader in his own right, a fact that rang out clearly in Ulery’s “Ethery.” For starters, trumpeter Johnson and bass clarinetist Bradfield opened with a two-part counterpoint that was rhythmically complex yet sustained a sweeping melodic arc. The rest of the band produced a slow-burn intensity that’s more difficult to achieve than casual listeners might realize. Perhaps some of this music-making felt a bit rarefied to those who want to hear a jazz band that plays loose and hits hard. But that’s not what Ulery and Loom are all about. This is a composer’s band, and the musician writing the tunes brings a degree of control and precision to the proceedings one sooner associates with contemporary classical music. Few modern-day classical scores, however, exude the jazz sensibility that permeates all of this music, to alluring effect.